We love Pretzel Crisps year-round. The flat, bite-size pretzels are terrific for snacking from the bag, dipping into hummus or other dip favorite, topping with peanut butter and a slice of apple, or turning them into canapés, topped with cheese, ham, smoked salmon and so forth. Throughout the year, Pretzel Crisps are available in Original plus Chipotle Cheddar, Everything, Jalapeño Jack and Sesame. But for the holidays, the special goods come out: chocolate-coated pretzels with a garnish of crushed candy canes. These delicious combinations of sweet indulgence and salty crunch are affordable stocking stuffers or party favors. We enjoy them plain, with a sweet dip, as a garnish for ice cream, or with a cup of something hot (cocoa, coffee, milk, tea). Delicious in both dark and white chocolate. Photo by Hannah Kaminsky | THE NIBBLE. 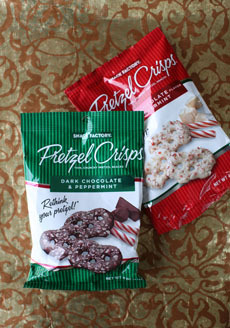 Pretzel Crisps are available at retailers nationwide. Here’s a store locator. You can also find them online.